Mix brownies according to box directions. Spread half the batter in a 9×9 greased baking pan. Arrange Junior Mints in a single layer over the batter. Spread the reserved batter over the Junior Mints. Bake at 350 for about 40 minutes or until brownies start to pull away from the sides. Cool completely in pan on wire rack. Cut into 9 squares. 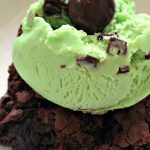 Serve with Mint Chocolate Chip ice cream.